GALION – A new business coming to Galion hopes to make a difference in the lives of young people and the school districts they attend. Duffy Learning Solutions, owned and operated by Shawna (Duffy) Kleinknecht, will offer such services as certified tutors, college and career counseling, test prep, and youth leadership training. Future services include, college-level tutoring, GRE prep, school consulting, and teacher professional development. Kleinknecht, a teacher, has a degree in secondary education. She has earned master’s degrees in instructional design for online learning, and training and performance improvement. She also has a certificate in college counseling from UCLA and recently was certified as a private tutorial practitioner through the National Tutoring Association. Kleinknecht said she is finishing up her doctorate in educational leadership and management. By establishing a scholarship in memory of her father, Robert B. Duffy, Kleinknecht wants to help students further their education after high school. Robert Duffy was a long-time resident of Galion and was a police officer at the time the memorial was established at Amann’s Reservoir. His name can be found on the plaque honoring those who served in the early 1960s. After leaving law enforcement, Kleinknecht said her father spent most of the rest of his life as a mechanic. He passed in 2002. The initial scholarship will be for a Galion student who plans to attend a 2-year technical college, but there is a hope to establish multiple scholarships for students in other districts. Kleinknect plans for Duffy Learning Solutions to start offering services by Jan. 15, 2018. Her goal is to recruit 50-100 certified teachers to work in Galion and other districts. Visit the company’s Facebook page to see a complete listing and to submit a resume. 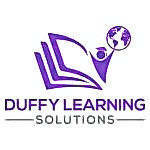 Families who may need a tutor should call 419-777-1209 or email duffylearning@gmail.com.